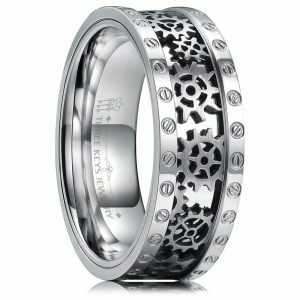 A Fantastic Selection of Men’s Titanium Wedding Bands! Finding a ring that looks great is probably your main focus when looking for a wedding band. However, making sure that your ring will last the test of time is equally important. 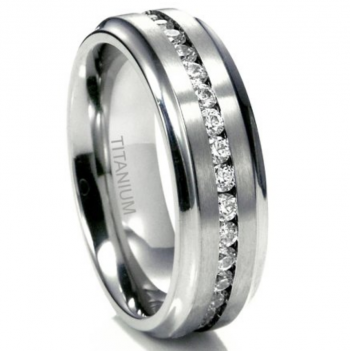 Titanium wedding bands offer both, providing you with an attractive ring that is tough and comfortable to wear. Our top ten list gives you some fantastic options for men’s wedding bands to get you ready for your big day! To begin our list we’ve chosen this modern wedding band – the designer really has created a minimalistic vibe with this piece of jewelry! This stylish piece has been designed with a black strip in the center that consists of a black checkerboard design. The pattern has been created with black squares in different shades, giving the piece some subtle detail. Smooth shiny silver titanium then frames the black strip by appearing either side of it. The titanium material has a beautiful shine – you can actually see your own reflection in the metal! The combination of the matte black checkerboard pattern and shiny titanium complement one another really well. The overall piece has an edgy businessman vibe so if you like the sound of that you’ll love this men’s ring. It’s great to point out that this ring is very comfortable, mainly down to the width of the band and the choice of material. The wedding ring has been crafted with an 8mm width band, giving you a slightly wider band, resulting in a comfy fit. 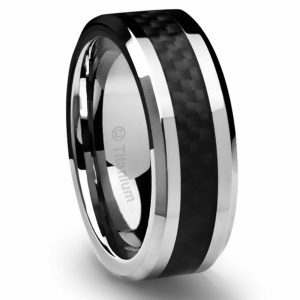 The smooth titanium material allows the ring to be easily put on and off. The band has also been created using a black carbon fiber inlay and has beveled edges, adding to the aesthetics and comfort. It’s important to point out that the titanium material used is very lightweight so you’ll feel like you’re not actually wearing the piece of jewelry. The jeweler also offers a one year warranty and 30-day money back guarantee if you’re not completely happy with the item, however, we don’t think this will be the case. This designer ring is being sold by Cavalier Jewelers for a low price. If you take a look at the design, quality of craftsmanship and overall look of the ring, this price is a fantastic bargain! 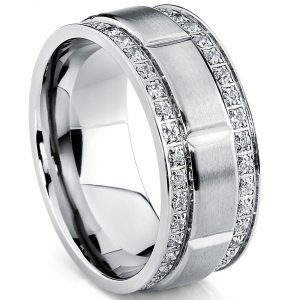 Don’t miss out on buying this men’s wedding band for your ‘hubby to be’ today. Brown and black look great together and this piece is no exception! 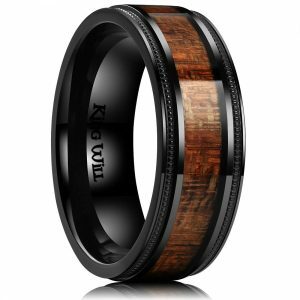 This earthy style ring has been crafted with a real koa wood center strip. This wood section has a very interesting texture and color to it. You can see the depth within the grain of this wood – with crisscross lines and colors ranging from brown, gold and orange look fantastic! This section really holds a lot deep. The surface is also very smooth and polished, giving it a stylish finish. The main structure has been created using a black colored titanium metal. It’s important to point out that this choice of titanium is weightier than our previous option. The choice of titanium also makes this piece of jewelry very durable and long lasting which means it will last for years and years to come! What we love about it is some of the special details that the designer has chosen to include, firstly the black titanium beading that appears along the edge. This detail definitely gives it an old traditional feel and gives the piece a lovely finish. The choice of titanium also allows for a high polished edge finish. The designer has chosen to create this ring with an 8mm width band. We think this is a great design decision because it allows it to feature a decent thickness of koa wood in the center as well and a thick black titanium border. This men’s titanium band would definitely be suitable for wearing to work or a business event. The smart and polished finish would suit this type of occasion and would look fantastic worn with a classic men’s suit and pair of leather shoes. Your stunning ring will arrive in a stylish black King Will’s jewelry box. This is great because it means that you can save some money on gift wrapping your piece and you will also have somewhere safe to store your ring while you’re not wearing it. 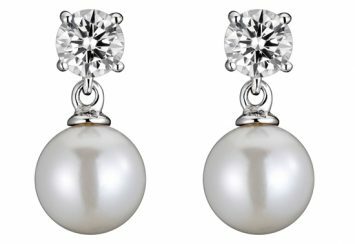 You’ll be pleased to hear that the jeweler will provide you with a lifetime warranty upon purchasing which we love! 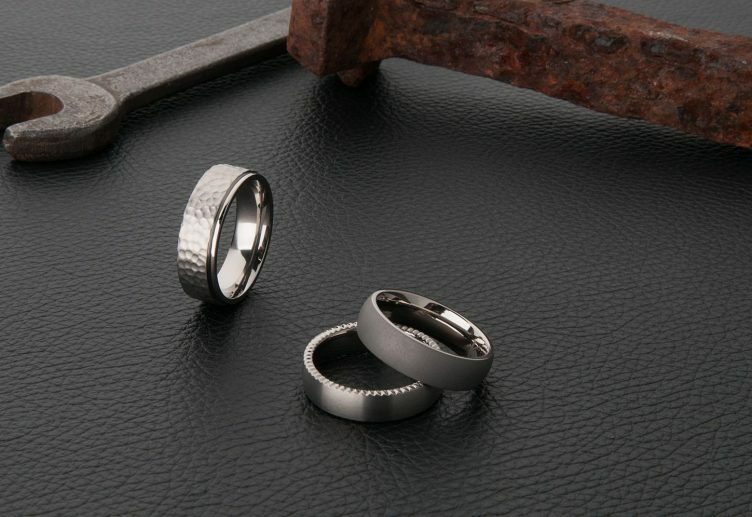 Titanium rings are a great option if you’re looking for a sturdy ring that will last for a long time which also looks the part. This ring proves just how well titanium bands work alongside smaller gemstones. The center edge of this band features a brushed titanium design which has the appearance of being much darker than the polished edges of the band which are much lighter and shinier. This again shows how versatile titanium rings can be! Set within the brushed titanium band are dozens of stunning cubic zirconia gems. These gemstones are deep silver in color and have been cut into a princess shape which further adds to the design. The dark grey color of the band complements the deep colored gemstones extremely well and makes this a really attractive piece. An important thing to remember with the designis that the cubic zirconia gemstones are slightly off center which means that they are closer to one edge of the ring. We think this is actually quite a nice feature of the design however it’s really up to you if you like this (it’s an important consideration as in some of the photos it looks as though the gemstones run along the center). The beveled edges have been polished to show a different style of wearing titanium. The polished effect has also been continued on the inside of the band to add to the comfort of the ring. 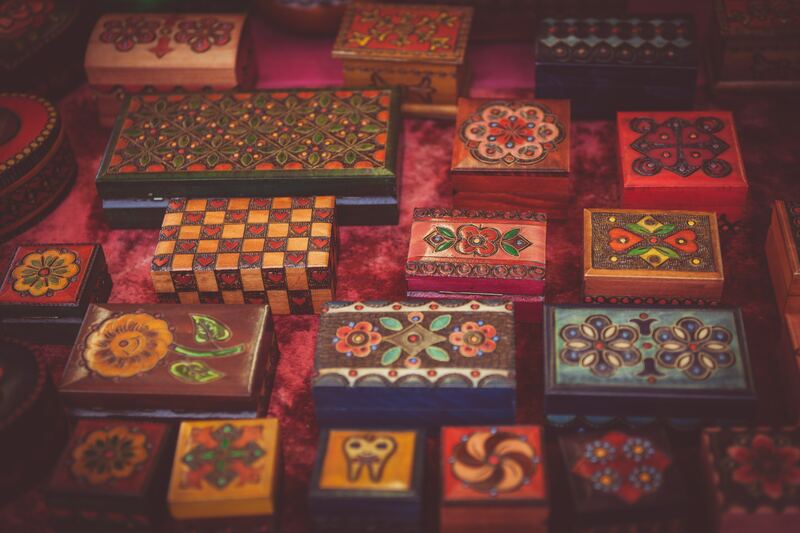 Your ring will come in a lovely ring box so you can keep it nice and safe and it also means it’s ready to go if you’re planning to buy this ring as a gift. If you like a touch a bling when it comes to your jewelry then this men’s titanium wedding band will definitely hit the mark! This stunning piece has been created using a metal brushed titanium metal for the foundation of the ring. This matte finish sets the scene for this stylish piece, making it stand out and gives it a more masculine feel. The titanium ring has been created with a lovely smooth shiny surface giving the piece a high sophistication appeal that your beau will simply love! The smooth inner surface of the band also gives the piece a very comfortable fit as well as an 8mm wide band. It’s important to point out that the material used is hypoallergenic which means it’s safe to wear if you have sensitive skin. One of the most important and eye-catching aspects is the sparkling diamonds. Along the center strip the designer has chosen to feature nine large circular cubic zirconia diamonds. They really do stand out and give this ring its much-desired glamour and status! These jewels definitely bring this men’s ring to life and give the piece of jewelry a lovely unique design quality. 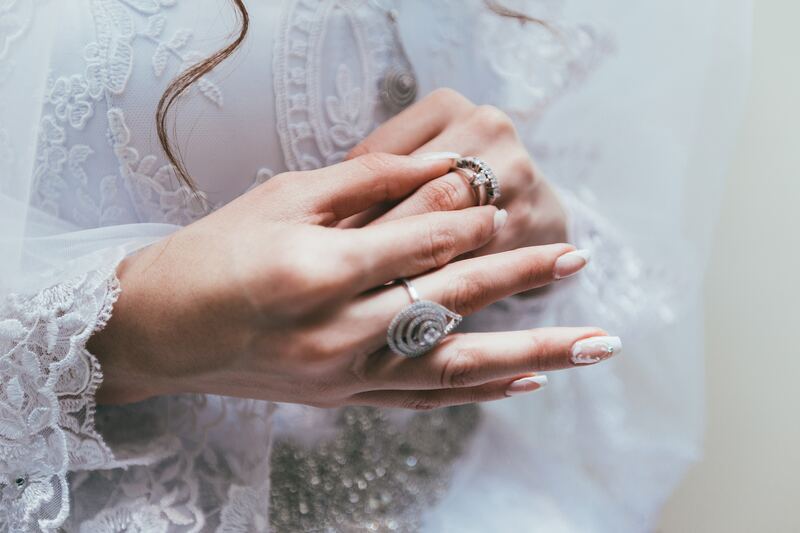 You’ll be pleased to hear that when purchasing one of these rings this jeweler offers a 100% money back guarantee if you’re not completely happy with your ring. This stylish ring is being sold by Metal Masters Co for a very low price which means you’re getting it for a great bargain. Buy this ring today! If there was ever a shiny piece of jewelry, this piece created by SOMEN TUNGSTEN is it! 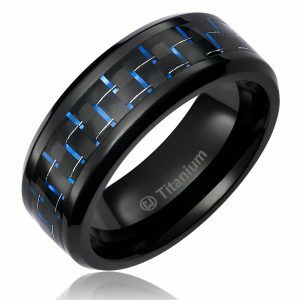 This is an extremely slick and glossy titanium ring. The piece of jewelry has been designed using titanium with a black high polished finish. The one thing that stands out about this piece is the glossy finish. This piece of jewelry is extremely strong and very lightweight which makes it a great wedding band to be worn on a daily basis. It is also resistant against corrosion and hypoallergenic which makes it’s suitable for people with sensitive skin. Titanium is a natural element which makes this piece of jewelry a fantastic piece. It ranges in size from 4mm wide to 6mm wide. By having these two options this means that if you want to have ‘his and hers’ wedding bands, this ring is a great choice. The inner surface of this ring has a slightly curved surface making this ring very comfortable to wear. This piece of jewelry is also available in a range of sizes including size 4, 5, 6, 7, 8, 9, 10, 11, 12, 13 and 14. 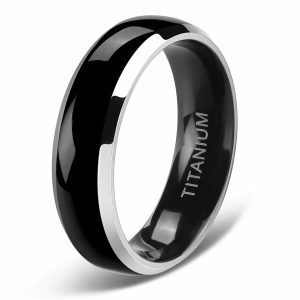 This stylish black titanium ring is being sold by SOMEN TUNGSTEN for a low price. It will arrive in a cute navy jewelry box ensuring your ring arrives with no scratches. Take a look at this ring for yourself, you’ll either love it or hate it! This titanium piece definitely has a 3D and futuristic feel to it that makes it stand out from all other options. 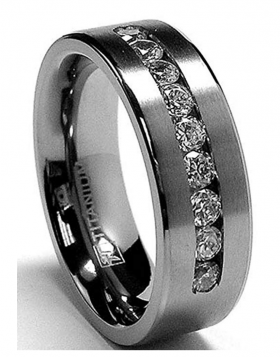 Cavailer Jewelers have done a fantastic job in creating this stylish men’s wedding band. The main structure has been created using a titanium material which means it is very lightweight but at the same time, nice and durable. One of the things we love about this ring is an interesting pattern along the center of the strip. This repeating pattern made up of a matte black color, bright blue and grey give it an eye-catching quality. It’s also important to point out that the center consists of black and blue carbon fiber inlay. The blue inlay has such a beautiful shine under natural light. The outer border of this ring consists of a black matt color which works well in finishing off the design of the jewelry. The inner section of the ring also has an understated look. We think your ‘hubby to be’ will want to wear this ring all day every day! Another great reason to buy this piece is that it’s suitable for men to wear who have allergies. The width is also 8mm wide, adding to its comfort and it promises to be super strong and lightweight. 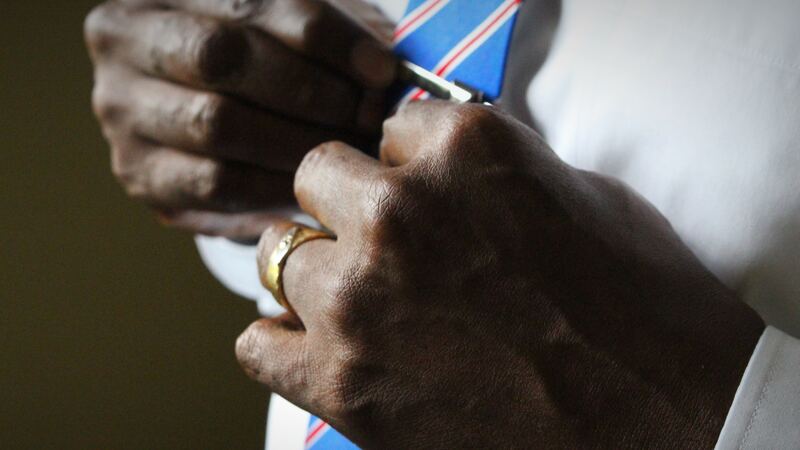 If your hubby has a hands-on job he won’t need to worry about bending this ring by accident because it’s very durable. This stylish ring is being sold by Cavalier Jewelers for a fantastic price! The jeweler promises a 30 day warranty or replacement if you’re not happy with the purchase. They also offer this ring in a variety of sizes depending on the size of your man’s fingers. If a bling is your thing, this might be your ring! This is a very uniquely designed piece which has a very bold design across the band. Made from titanium, the center of the band has been divided into equal rectangles making a real feature out of this brushed metal. The center ridge of the band is slightly raised above the sides of the band and this helps to draw attention to the simple design. This is a very clever way to decorate the ring without having gemstones or overly complicated inscriptions. Along each edge of the band, the slightly lower profile works really well as the backdrop. Along each edge are dozens of cubic zirconia’s which have each been set in place within a simple prong setting. The overall effect is one of sparkle and glitz which adds something quite special alongside the very clean cut design of the band. Another feature that we really like is the polished side profile and underside of it. This not only looks wonderfully clean and crisp from the side, but it also means that it will be comfortable to wear. You may not notice from the top, but this ring has a small ridge along each side of the band. This still sits below the height of the center strip of the band and works really well as part of the overall design. 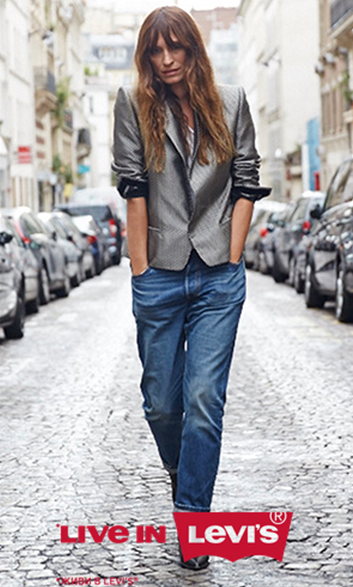 This is a very glitzy piece that is sure to grab people’s attention! Your ring will come in its very own ring box to keep it safe and you’ll also get a 30-day money back guarantee which covers you in the event that you aren’t happy. We’re sure however that you will be happy and this ring is a great option if you’re looking for a men’s ring which has that extra sparkle! Simplicity is at the heart of this ring. Along the center of the band, you’ll find a real deer antler inlay. Upon first looking at the ring you may think that it’s quite plain but upon further inspection, you’ll see that this ring has extra depths. The surface of the deer antler looks almost like marble and features a range of shades and textures. It’s almost as though the deer antler looks like polished wood. Another important aspect is the contrast between the marble color and the shiny silver titanium border. This smooth shiny texture gives it a clean stylish finish that makes the ring look like a very sophisticated piece of jewelry. The ring is made from pure titanium and is extremely durable and lightweight to wear making it very comfortable. This piece is being sold by SHARDON for a low price which makes this piece of jewelry a fantastic price. The ring also comes in a cute ring box that will keep your ring protected from any scratches. It will easily give your ring somewhere safe to store it. One word used to describe this ring is ‘industrial’. It will instantly remind you of the inner workings of a clock. The section in the middle features dozens of cogs in all different sizes. You’ll notice that the cogs range in size from small, middle and large. The display of cogs is really quite interesting! The industrial look continues along the edge of this men’s ring. You’ll notice that either side the designer has chosen to include a border that features the symbol of a screw. The border is made up of tiny screws that have actually been indented into the surface of the titanium. Even though the designer has chosen to include a lot of intricate detail within this wedding band they have cleverly kept the texture of the surface quite plain which makes the pattern stand out even more. The surface of the titanium is extremely smooth and shiny. This quality, in turn, helps to emphasize the rings sense of three-dimensional quality, making it a very stylish and unique piece of jewelry. When it comes to the main structure the piece is 100% high-quality titanium. It’s extremely strong, lightweight and comfortable to wear. The material is also resistant against corrosion and colorfast and has a metallic luster. The ring has been designed with an 8mm width which adds to the comfortable fit. The ring also ranges in a variety of sizes so you’re guaranteed to get the correct size so the piece of jewelry is a comfortable fit. 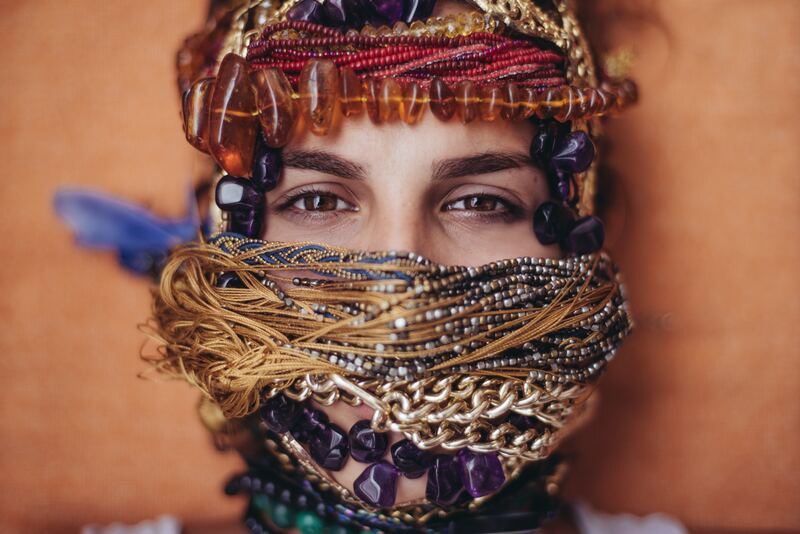 If you decide to purchase this statement piece you’ll be pleased to hear that the jeweler will give you a lifetime warranty and a 100% free return or exchange if you’re not completely happy with your piece. We think this would make a fantastic wedding ring for the man in your life or as a gift for a special occasion like a birthday. It will arrive in a stylish jewelry box which consists of a brown colored box with a smart branding logo featured on the top of the lid. This jeweler box is definitely a keeper! This men’s ring is being sold by THREE KEYS JEWELRY for a low price and we think this is great news! Even though this is the last option that we’re reviewing it’s by no means the least desirable wedding band for men! We’ll begin by talking about the design – the designers have really gone to town with the design. 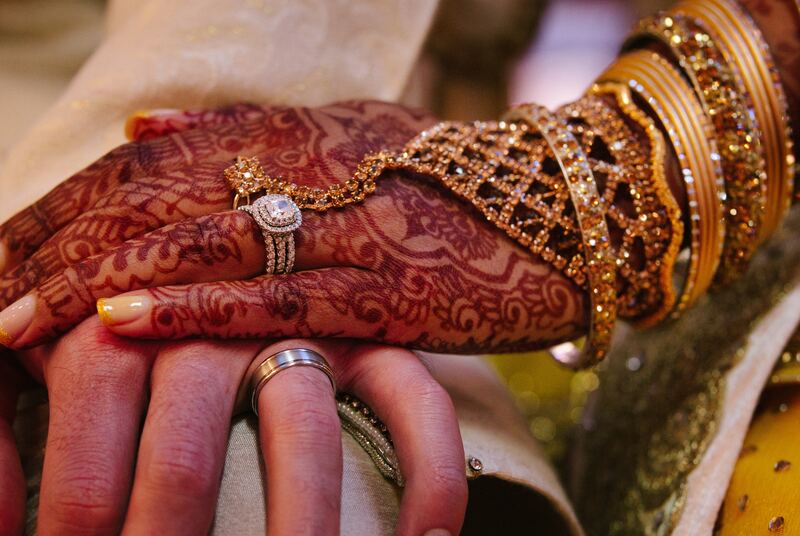 They’ve chosen color, texture, and patterns to feature all in one ring. To begin with, the ring includes a strip in the center of the ring that is made up of a blue and green mosaic pattern or even a stained glass window. This colorful piece really catches your eye and when the sunlight reflects on it, it shines beautifully. Either side of this we have a brown wooden strip. You can make out the wooded texture strip that includes the interesting grain of the material. The dark brown also works well in toning down the blue and green mosaic pattern slightly. 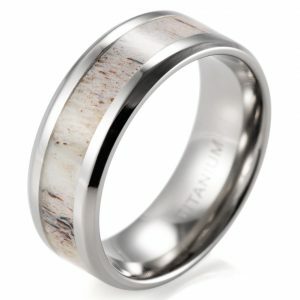 Finally, it features a strip of silver titanium along either side of a wooded strip which reminds the material of the beautiful solid foundation of this ring. This really is an interesting mix of materials! The ring has been created using titanium and a tungsten carbide material. It’s lead-free and hypoallergenic which makes it suitable for people to wear who have sensitive skin. The men’s ring has a permanent shiny polished surface to it which makes this a timeless piece of jewelry! It is very masculine and gorgeous. The inner surface of the ring continues to be very smooth and shiny, giving this band a comfortable and snug fit. The sizes range from size 7, 8, 9, 10, 11, 12, 13 and 14. The jeweler is selling this piece of jewelry with a 365 days money back guarantee if you’re not completely happy with the item. 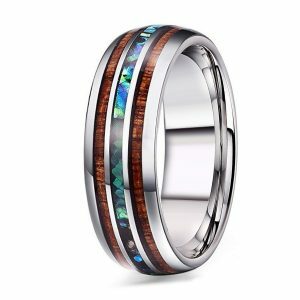 This men’s ring is being sold for a low price by Adramata. This ring is truly unforgettable so why not treat yourself! When it comes to cleaning your titanium ring its best to soak your ring in some warm water that has a little bit of dishwashing liquid in. Ensure that you soak your ring in the solution for around 5 minutes. When it’s had enough time to soak, gently rub the dirt and grease off your ring using a soft cloth. 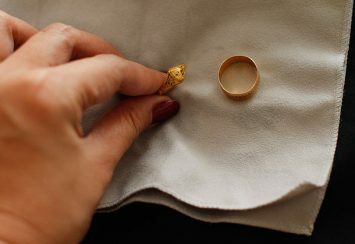 Once clean, make sure that the ring is rinsed with water and dried with a clean towel. It’s important to be aware that leaving your titanium ring to dry on its own can actually cause damage to the ring. Inevitably over time, your titanium ring will scratch, however, to ensure it doesn’t get needlessly damaged it’s important to remove your ring before having a shower or before going for a swim. The chlorine in the swimming pool could damage the titanium ring. It’s also important to have somewhere safe to place your ring so it doesn’t get scratched or lost, take for instance the gorgeous box it came in!